The top-of-tank mounted LTC (Liquid Tank Conditioner) has become an industry standard for reducing condensation and controlling microbial growth in Liquid Sugar and High Fructose Corn Syrup (HFCS) storage tanks. Using a combination of particle filtration via a series of media filters and microbial inactivation by High Output Shatter-proof UV lamps, these units have been reliably providing clean, disinfected air to the headspace of liquid storage tanks. Combining innovations in materials and fabrication techniques, industry trends and decades of experience, the next generation of LTC units was created. Liquid Tank Conditioners mount on top of liquid storage tanks and provide unsurpassed filtration and UV sterilization. Using high grade stainless steel, 10 micron filters, 0.3 micron absolute HEPA filter, a 140CFM blower motor and two shatter-proof coated UVC germicidal lamps, these UV systems will filter and disinfect air in the tank headspace. The blower supplies clean, disinfected air into the tank at all times creating positive pressure in the tank headspace. 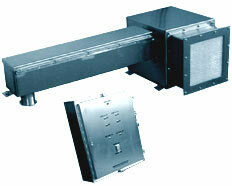 The LTC double-lamp UV systems are suitable for drop-out rates of up to 200GPM. The BT Liquid Tank Conditioning UV systems can be mounted directly to the tank or remotely (up to 25’) and provide a UVC dose of more than 30,000µWs/cm² using high output, shatterproof lamps. The systems include airflow and LED lamp-on indication and standard 4” Tri Clamp connection. 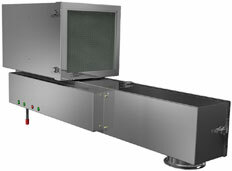 The BT UV systems are with 4, 6 or 8 ultraviolet lamps. Designed for tanks holding 20,000 US gallons (75,710 liters / 75.7m³) and more, the SC-4AB tank conditioner can be mounted on the floor next to the tank for easier lamp and filter changes that do not require climbing on top of the tank. SC-4AB14 is equiped with 14" filters - one HEPA FLT060 filter and 2 electrostatic FLT055 filters, 250 CFM blower, four 36" GML100 4-pin Slimline UV lamps, Air Flow and Lamp-out indication. The TTG Series is designed to sterilize tank headspace as well as deliver germicidal UV energy to the liquid in the tank. The lamp is housed in a quartz sleeve for protection, as the lamp is partially submerged, suspended in the tank by a double-grooved gasket. The stainless steel electrical enclosure (which also holds the lamp in place) fits on top of the tank and features a Tube Guard to indicate that the lamp is operating properly. American Air & Water offers a full range of in-line UVC disinfection systems for all liquid disinfection applications, including water and liquid sugar. In-line systems for liquid disinfection deliver the EPA-required UV dose of 40,000µWs/cm² (40mJ/cm²). Ultraviolet water disinfection systems can be provided for applications from 1GPM to millions of gallons per day. Please consult American Air & Water for proper sizing of in-line UV disinfection equipment. We can provide units to customer specifications. If a fitting other than the standard 3" Tri clamp or 3" PVC female threaded coupling is required, we will be provide the connection size and type needed. See LTC Specs for complete details. Food-grade welding is optional on the liquid tank UV units and air filter vents. Provides visual indication of reduced airflow resulting from clogged air filters or blower failure. Provides visual indication of UV lamps operational status. A Fluoro Ethylene Polymer sleeve is shrunk onto each UV lamp, preventing any quartz fragments from entering the tank in the unlikely event of lamp breakage. All LTC and BT UV lamps are shatter-proof coated. Provides additional protection for the filter media against sun and moisture. Recommended for outdoor applications. Units can be fabricated from 316 stainless steel or other materials and subjected to a variety of treatments per customer request. Our equipment can be configured to provide information to monitoring equipment and integrate with existing systems. Because of the warm, moist environment, liquid sugar and syrup storage tanks are breeding grounds for bacteria, mold and yeast. 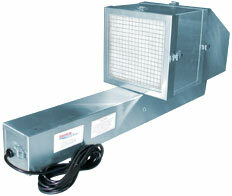 American Air & Water offers several types of germicidal ultraviolet UVC and filtration systems to combat the problem. Our UV systems are specifically designed for liquid storage tank applications. They break down the DNA of mold spores, yeast and bacteria. UV is ideal for liquid storage applications because it has no effect on the taste, color or odor of the liquid. In fact, unlike chemical sterilization UV neither adds nor removes anything from the liquid sugar, syrup or water. The filters prevent dust, dirt and other mechanical contaminants from entering the headspace of the tanks.